Many students have heard their parents tell them that “money does not grow on trees” as a means of instilling financial responsibility in their children before they go to college. But when students arrive at college, where they’re left to fend for themselves, many manage to forget all those lessons, often resulting in a financial aid refund-shopping spree and, later, a dreaded call to mom and dad asking for a little cash. Both before and after students run into these financial troubles, the Sam Houston State University Student Money Management Center is available to help students learn from their mistakes and the mistakes of others. Financial Literacy Week, the center’s biggest event of the year, can be just what students need to become financially responsible adults. “Financial Literacy Week provides our students a unique opportunity to refine their money management skill sets,” said Patsy Collins, SMMC director. The seventh annual week will kick off on Monday (Feb. 23) at 10 a.m. in the Lowman Student Center Mall Area, during which time students can meet The Learning Channel’s “Extreme Couponer” Tiffany Ivanosky. “Tiffany usually goes ‘shopping’ before she comes to SHSU and shows students ways to mix and match coupons with sales, store savings cards and newspaper ads. She shows how she made money with a mixture of purchases and how students can do the same,” Collins said. “Last year, she had lots of free coupons for students. For example, she had a coupon for free waffles that she gave to all the students who came to the table. The kickoff will be followed by a series of presentations in the LSC Theater. The center will continue its lesson on “extreme couponing” after the kickoff, with a seminar at 1 p.m. that will give every student the skills to become a coupon king or queen. At 3 p.m., “Future Careers, Big Benefits” will offer advice for learning how to assess salary and benefits in offers of employment, followed by an “Identity Theft” presentation that will wrap up the first day of Financial Literacy Week at 5 p.m.
During the identity theft presentation, University Police Officer Joe Thornton will identify methodologies to prevent and detect identity theft, as well as provide notification guidelines for people who have had their identity stolen. On Tuesday (Feb. 24), the “Scholarships 101” seminar, from 11-11:50 a.m., will be offered, followed by a “Pinterest Workshop,” from 12:30-1:20 p.m., that will feature Financial Aid Office senior counselor Laura Ringo, who will give tips on how to decorate your apartment on a dime. “Laura is truly talented at finding unique ways to cut expenses by using Pinterest as her starting point,” Collins said. Other Tuesday activities include “Be Your Own Boss,” from 2-2:50 p.m., and “Get Covered,” from 4-4:50 p.m.
Wednesday’s (Feb. 25) keynote address “Own It and Move Forward,” at 11 a.m., will feature Donald Bowers II, the assistant vice president of the Federal Reserve Bank of Dallas, Houston branch. Bowers is a graduate of the Sam Houston State University Master of Business Administration program, who will share his experiences and knowledge to teach students about money and professional success. He joined the Federal Reserve Bank’s management development program in 1991 and in 2004 was promoted to assistant vice president. Following the keynote address will be the “Relationships and Money” seminar at 3 p.m., a financial aid presentation at 5 p.m., and a FASFA Workshop at 6 p.m.
Thursday (Feb. 26), the last day of Financial Literacy Week, will feature “Healthy Meals on a Dime” at 11 a.m., “Investing in Your Future” at 2 p.m., “Fun on a Budget” at 4 p.m., and, closing out Financial Literacy Week, “Veterans and Finances” at 6 p.m. The Student Money Management Center is offering student organizations a chance to win up to $1,000 just by attending financial literacy week events. The organization with the highest attendance percentage at each event will win. The second place prize is $750 and a third place prize of $500. Organization rosters must be submitted before 5 p.m. on Thursday (Feb. 26). In addition three $650 scholarships will be awarded to students who attend Financial Literacy Week events. The more events students attend, the better their chances of winning. 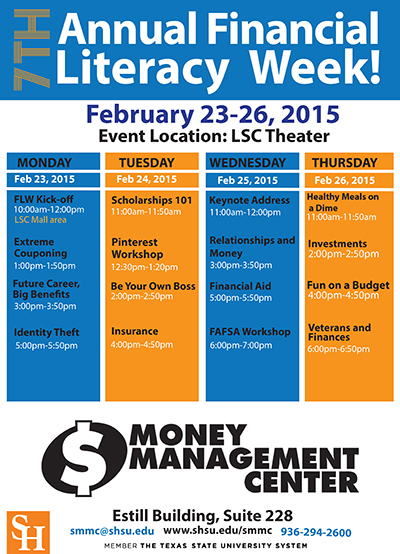 For more information about Financial Literacy Week, contact the Student Money Management Center at SMMC@shsu.edu or 936.294.2600.